Razer has launched a new flagship gaming keyboard featuring its own branded Opto-Mechanical switches. 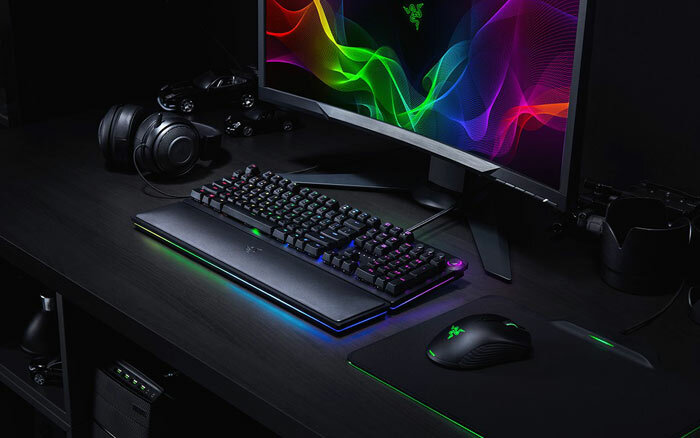 The new gaming keyboard is called the Razer Huntsman Elite and features the new faster and more durable keyswitches plus niceties you would expect such as 10-key rollover, macros, an aluminium top plate, hybrid onboard / cloud storage, and Chroma RGB lighting effects and sync. 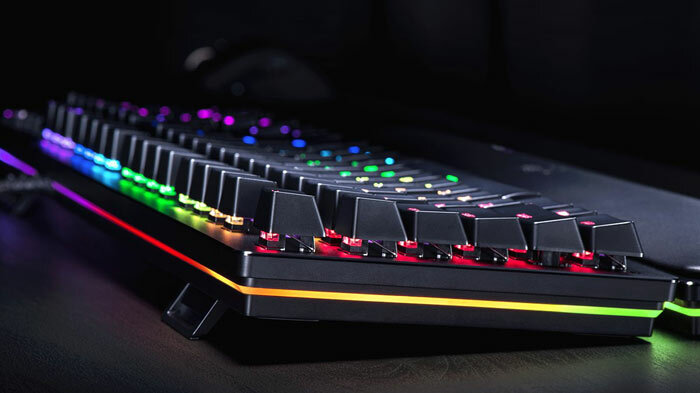 Razer has also launched a standard Huntsman keyboard which shares all the key features of the Elite but misses out on; a magnetic wrist rest, a multi-function digital dial and media keys, and an underglow feature powered by Razer Chroma. The news behind the pair of new keyboards is all about the switching tech employed. Naturally the Razer CEO has something to say on the new development. "We have amassed years of experience developing and manufacturing our very own Razer Mechanical Switches designed specifically for gamers," said Razer CEO and Co-Founder Min-Liang Tan. "This focused expertise has now expanded upon our brand's legacy with the new Razer Opto-Mechanical Switch that delivers an all-new level of performance that is optimized for top-tier eSports competition." Inside Razer's opto-mechanical switch the key's actuation relies upon an IR light beam being broken as the key is pressed. Despite being new technology it makes key construction simpler than traditional mechanical keys and they don't have some of the physical characteristics that are a problem of the traditional mechanical switch design. Specifically, the Razer Opto-mechanical switch has a 1.5mm actuation point, which Razer says allows it to be 30 per cent faster to press than traditional clicky switches. The actuation force is set at a light 45g, and these switches offer a similar tactile feel to the Razer Green switches (no other choices at this time). 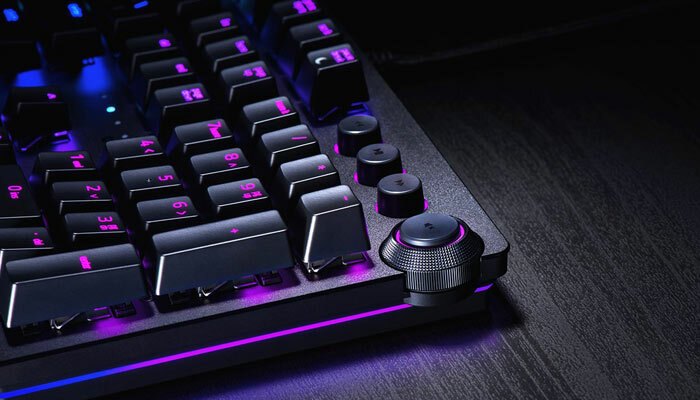 The keys are rated for up to 100 million keystrokes, doubling that of traditional mechanical switches, and the feel should be more consistent over time, says Razer. Another feature is the inclusion of a metal key stabilizer bar fitted around each switch, not just around the larger switches like you see on regular mechanical keyboards. The Razer Huntsman Elite and the regular version are $200 and $150 respectively. Probably the biggest attraction of the Elite model is the dial. This can be used to quickly adjust brightness, volume, and more options via the Synapse 3 software. It is accompanied by dedicated media keys. Meanwhile the regular huntsman user will have to rely on function key modifiers for media and brightness control. If you would like to have a matching detachable leatherette wrist rest - that's another reason to opt for the Elite model. I bought my partner a Razor keyboard last year and it's great aside from the fact their servers went down one day and the Synapse software wouldn't work as it's all cloud based. This annoyed her no end as all her game macros stopped working until they'd fixed their servers a day or two later. I'm not sure they've fixed that problem or not, you would assume they should just keep a local copy of any settings so if the servers are down you can still use your keyboard / mouse as you were previously. I've been using a Qpad MK-85 (MX browns) for nearly four years now but, I can't say I have ever felt the keyswitches were too slow to respond. How much faster can Razer's switches realistically be with 0.5 mm less movement? Seems like a solution to a problem that doesn't exist, at least not for most people. This is just a non issue and it's just like selling gold plated HDMI cables for standard use at a massive mark up. If you want to improve response times there are loads of areas of the PC which introduce latency where you could work on it. The keyboard really isn't a source of latency in my experience and shaving a couple of milliseconds off the time it takes to depress a key is not going to have an effect when you look at the duration of your ping to the server. And that's before you get to latency introduced within the PC itself. And the Razor Synapse software is utterly rubbish. I've never seen such nonsense for a something as simple as a keyboard. They've made it far too fancy for no major benefit - I do not want to pay for a cloud system just to keep 5 macro keys the same for if I happen to move my keyboard to another system. Surely if it was my own system I'd have the software installed locally and just set it up and if it was someone else's then I'd accept that I may just have to set it up again. Or maybe use a USB key. The number of issues this utterly terrible software has caused far exceeds the number of times it has benefited me. Keep it simple, stupid! Except Wooting made a much better keyboard with laser switches and innovated with them instead of chucking RGB lighting all over the shop. This includes things like setting your own actuation point (I use 1.3mm) and analogue input emulation which is great for certain games. It's also cheaper and will probably sell a lot less than the Razer because Razer.